February 7, 2019 (Johnson Valley, CA) – There are three distinct classes in the 4WP Every Man Challenge (EMC), but only one racer can cross the finish line first, regardless of whether they are in the Yukon Gear Modified Class (4500), Spidertrax Stock Class (4600), or Branik Legends Class (4800). Last year, Dan Fresh was the first finisher in his 4500 Class Jeep, but in 2019 the 4800 buggies ruled the roost, filling the first five finishing positions in the 4WP Every Man Challenge. Michigan’s Casey Gilbert repeated as the 4800 winner in his Miller Motorsports Jeep, adding the bragging rights of overall EMC champion as well. Gilbert has been involved in Ultra4 Racing for years, co-driving for Mike Coleville and previously campaigning a Stock Class Jeep Cherokee. 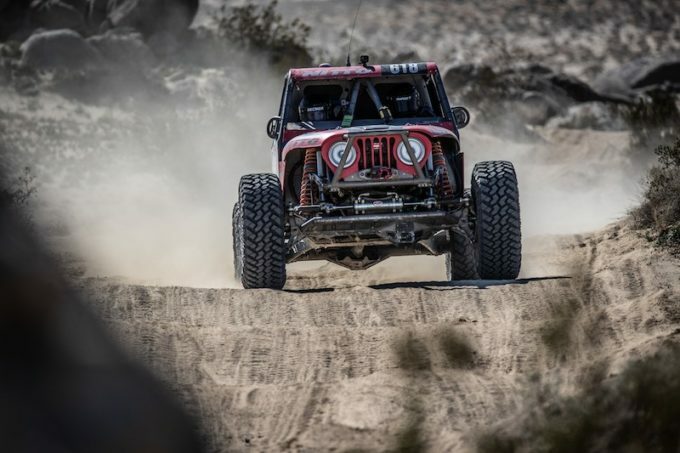 The punishing 165-mile course consisted of high-speed lake beds, tight twisting turns, and some of the hardest rockcrawling canyons in the world, with only 48 of the 130 vehicles that started the race reaching the finish line. Casey Gilbert qualified for the EMC race in the pole position and battled with Levi Shirley for much of the day until transmission issues took Shirley out of contention. “Starting in the pole position, it’s hard to pace yourself because you know everyone behind you has time on you,” Gilbert shared at the finish line. “It’s really a Catch-22, though, because I like clean air, and I race better when I’m out front in the fresh air. When Levi got around us for about 30 miles, following behind him was tough.” 2016 and 2017 EMC winners Brad and Roger Lovell finished second in the EMC race in their Ford Ranger buggy. The epitome of the Legends class, Colorado’s Lovell brothers completed the race in the same vehicle they have raced at Nitto King of the Hammers for the past decade. Riverside’s Jason Bunch qualified second for the EMC race and physically finished third, but Bailey Cole beat Bunch on corrected time to round out the podium in the 4800 Class. The Branik Legends Class allows tube chassis vehicles, but requires a front engine and two seats and must run 37-inch DOT-approved tires. Casey Gilbert #618 takes the win. Ryan Del Ponte photo. Longtime Ultra4 racer Jimmy Jack and his wife/navigator Amy Jack took the win in the Yukon Gear Modified Class. “Every year he gets better and better at driving and trusts the car more,” Amy Jack gushed after the race. “It probably doesn’t hurt that he has his wife in his ear saying, ‘settle down honey’. I think with me in the car he doesn’t take unnecessary risks and that helps with us finishing. We had a great pit crew and we knew exactly what we wanted to do. We raced our own race and tried not to race against anyone else. KOH is absolutely awesome. I would tell anyone to come out here and try this.” Jimmy Jack used his buggy to push 4500 Class rival Dan Fresh through the Jeep Arch before the finish line after Fresh’s vehicle stopped running. Fresh and teammate Mike Kim then got out and pushed their race car across the finish line to take second place in 4500. Rockcrawling champion Justin Hall took the bronze home in the 4500 Class after swapping out a broken transfer case following Monday’s qualifying. The Yukon Gear Modified Class requires starting with a production-based vehicle with a factory appearing body, partial frame, mechanical steering, and 37-inch DOT approved tires. Interest in the Spidertrax Stock Class has reached a new high this year, with 28 entries for 2019. The 4600 Class has the most restrictive rules at King of the Hammers, requiring the factory engine, stock frame, full body, single shock, and 35-inch tall DOT-approved tires. Longtime Spidertrax Stock Class racer Justin Reece has finished on the podium in the EMC race in the past in his leaf sprung Toyota pickup, but hadn’t finished on the top step until this year. Reece ran a near perfect race to finish 19th overall in the EMC race against more powerful vehicles with larger tires and shock absorbers. He beat out second place Alex McNeil by nearly an hour, and third place Josh Attebury by nearly two hours. McNeil came from Alberta, Canada to compete in the EMC race in the Jeep Grand Cherokee he purchased from Erik Miller in 2015. Another Jeep Grand Cherokee finished on the podium for the Spidertrax Stock Class as well, driven by Josh Attebury of Show Low, Arizona. Erik Miller and Robby Gordon finished the race in the Jeep Gladiator, an impressive feat for the new truck. Not on the lakebed? Follow all of the action at ultra4racing.com/live.